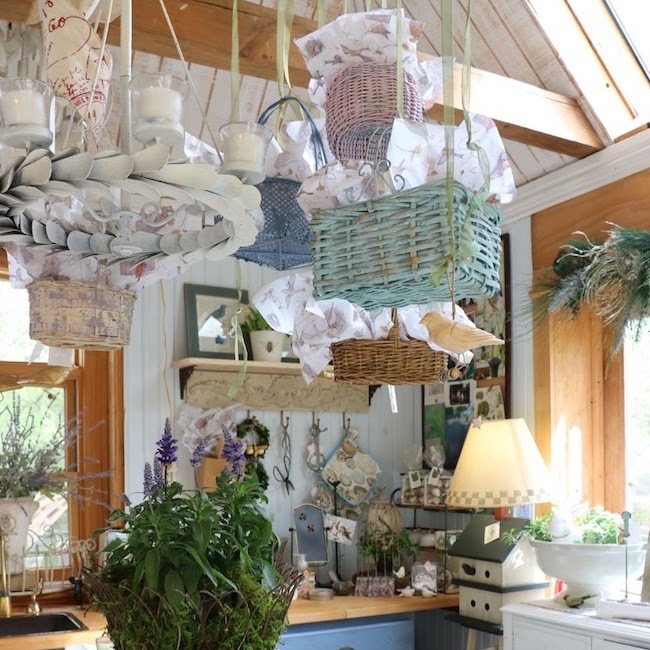 Dressing our homes with greenery has its roots in the Druid culture, followed by the Romans, then the Germans, and by the English Queen Victoria whose husband was German. 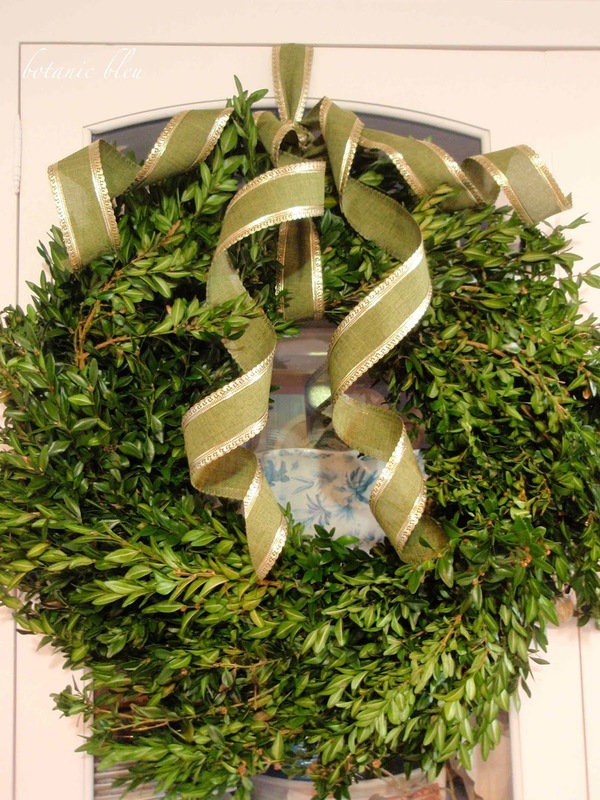 Even before Queen Victoria, residents of Williamsburg in America dressed their houses with elaborate wreaths made from fruits and greenery including boxwood. 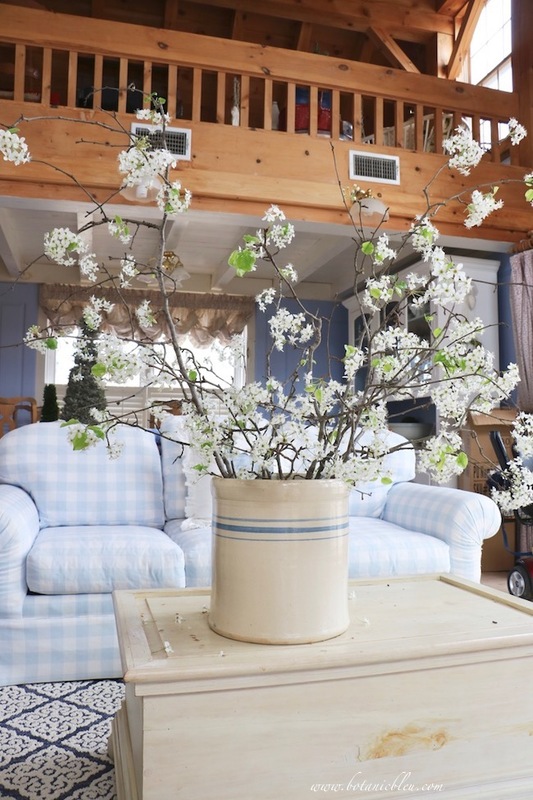 The love of boxwood continues today in homes all across America, including in mine. 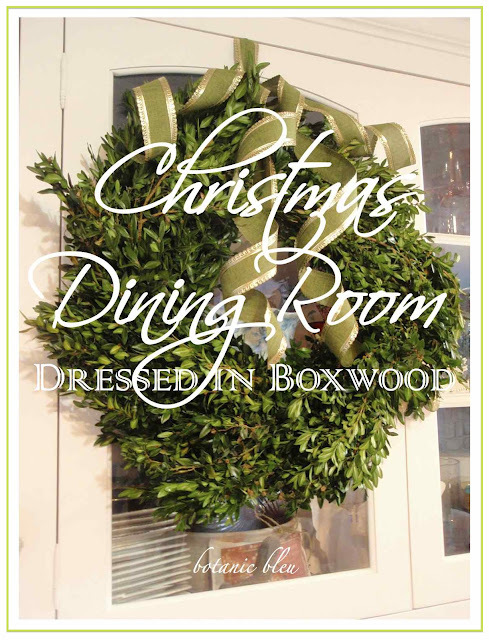 This Christmas season, boxwood is throughout my house, beginning with the dining room. Fresh boxwood hangs from the china cabinet and nestles a hand-carved swan on the English pine table. Simple greenery that evokes a Christmas feeling without fanfare or sparkle or glitz, but with the same spirit felt by our ancestors throughout history as they hung greenery as reminders of life in the darkest days of the year surrounding the winter solstice. 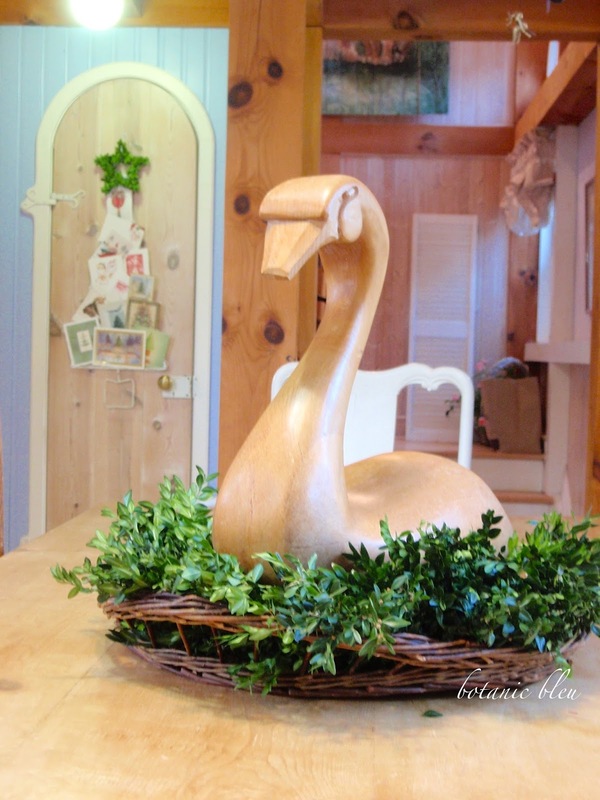 Found at a street fair in New Hampshire in the late 1980s, the swan normally resides on a ledge atop one of the sets of French doors in the living room. This Christmas he sits atop boxwood in a rustic flat basket. A small preserved boxwood star tops the wire Christmas tree holding old Christmas cards hanging on the arched-top coat closet door. 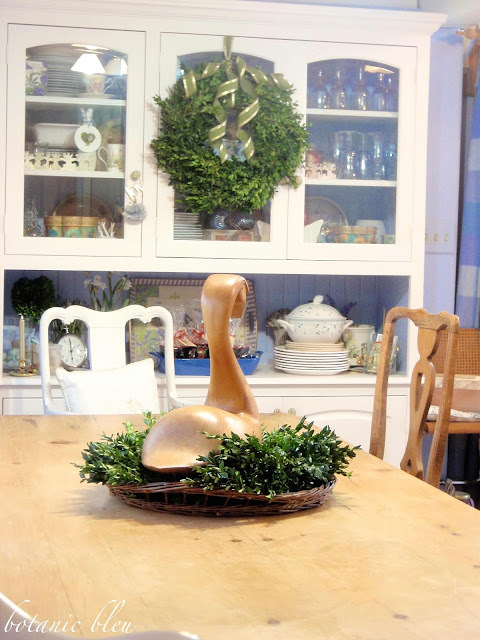 A full fresh boxwood wreath hangs on the center of the china cabinet. Small peeks through the center of the wreath give glimpses of china, glassware, Christmas gift boxes, handmade paper angels, and Christmas ornaments. 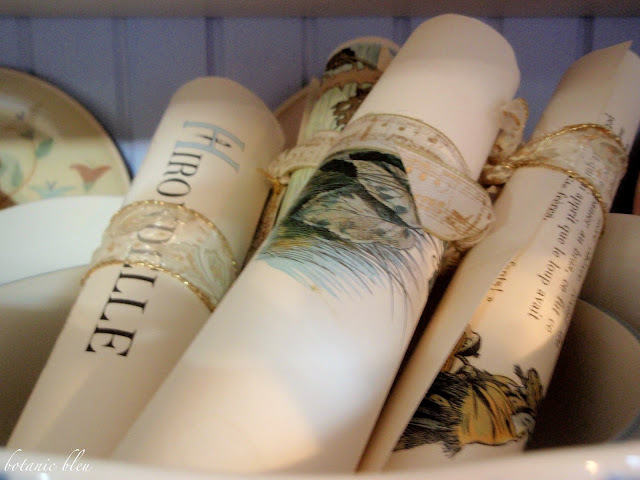 A handful of rolled pages from a French alphabet children's book lie in a bowl inside the china cabinet and are tied with small snippets of gold and white music-printed ribbon. One of the armchairs holds a new gold and white Christmas pillow embroidered with a deer and a tree with just a little glimmer. 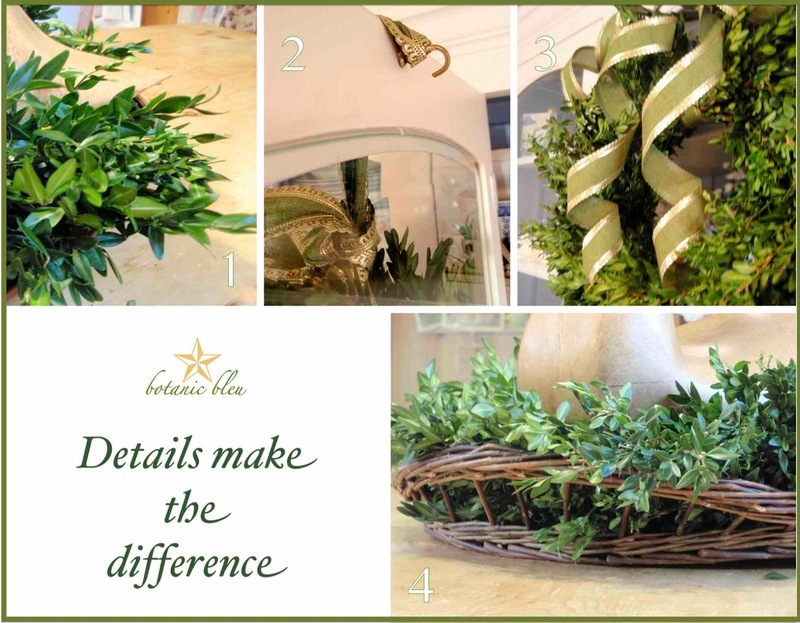 The details are beautiful and are subtle gold touches to the room that is mostly decorated with only a handful of natural boxwood greenery pieces. 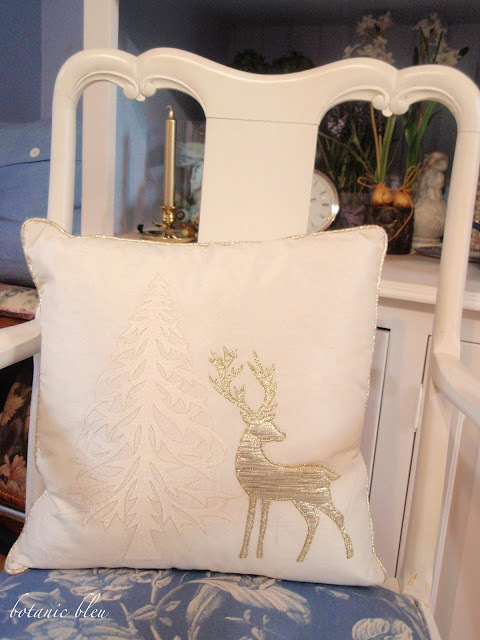 Small details like the gold piping around the cushion make a big difference in how the room looks and feels. Often people cannot pinpoint why a room appeals to them, but chances are finishing touches like the gold piping add to the room's appeal. 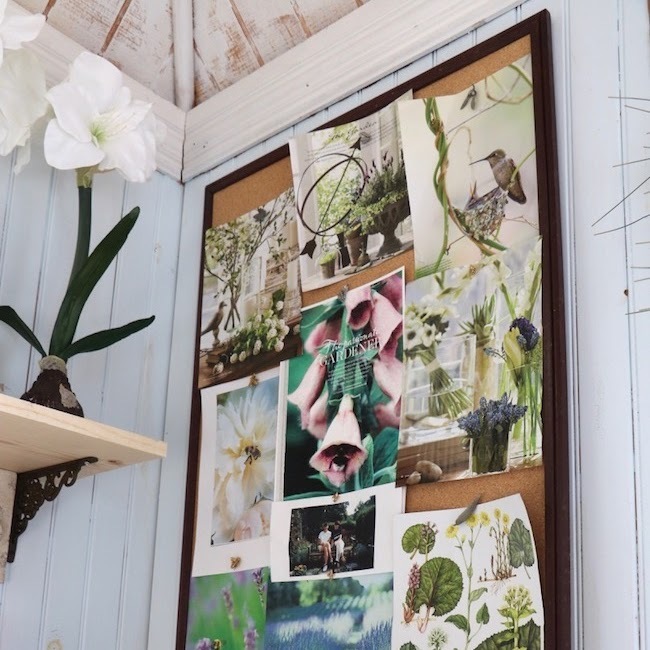 Yes, details make the difference between a room looking finished and a room looking like a work in progress. These four photos illustrate some of the details in the dining room dressed in boxwood. 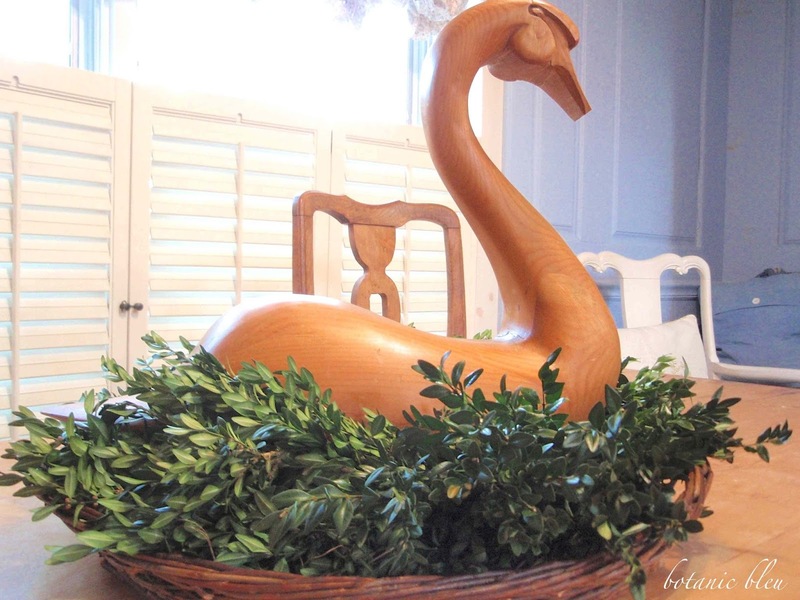 The boxwood shines because it was lightly sprayed with plant polish, Green Glo. Plant polish is what makes plants from florists look so healthy and shiny. 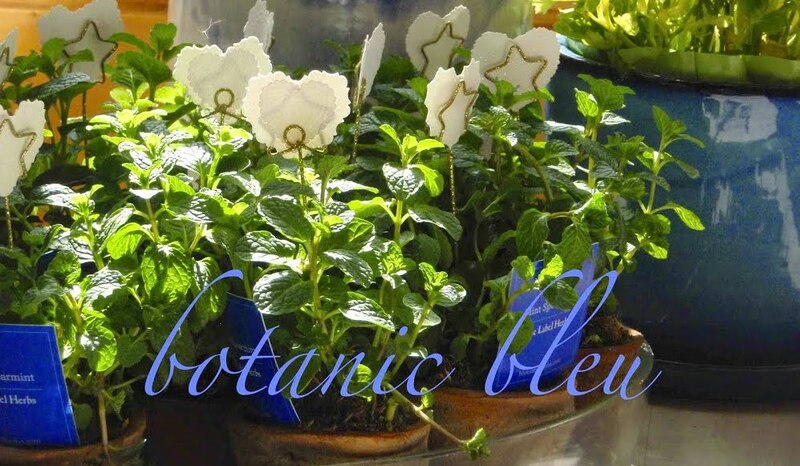 Look for it at grocery stores with a plant section, or at discount stores like Michaels and Hobby Lobby. 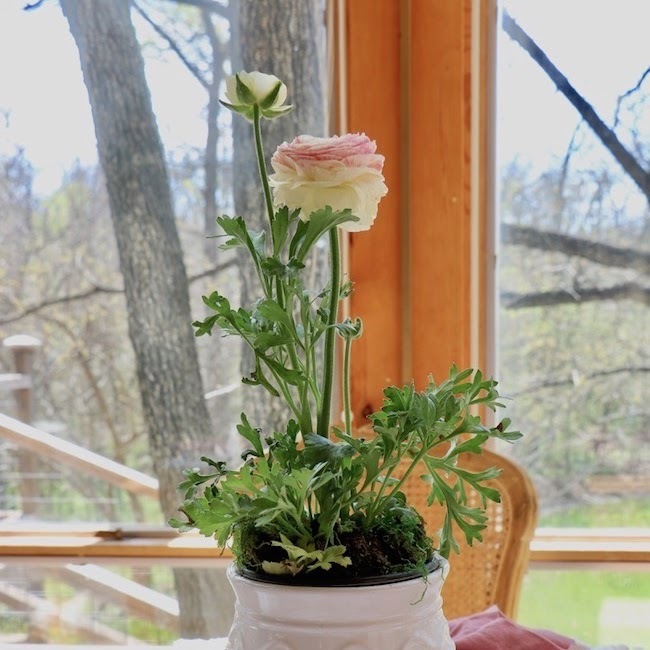 Try it, and you will never have an unpolished green plant again. A gold cup hook screwed into the back of the china cabinet door provides an easy way to hang a wreath from the china cabinet. Face the cup hook down, and use a ribbon to secure the wreath to the hook. Wired-edge ribbon makes creating bows and curly ribbon tails easy, easy, easy. What did we ever do before wired edges on ribbons? 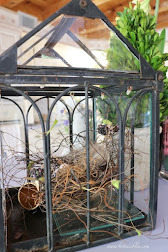 Gathering centerpieces in a container (basket, box, bowl, ... ) anchors the arrangement and gives it a finished look. One of the things not finished at my house is wrapping the presents. The little green holly decorated bag holds tape, tags, and tissue paper reminding me there are less than two weeks left until Christmas. 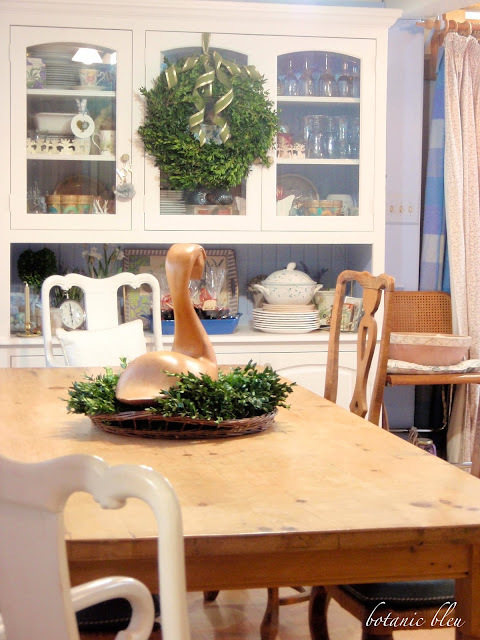 Plus, there is still more boxwood to hang in other rooms. One room down, and more to go. Take a peek at how I revived the water-damaged finish on my English pine table. Always a treat to stop by Judith. I haven't found time to decorate for the season but your home is beautiful as always. Merry Christmas! I enjoyed this lovely tour of your dining room so very much. 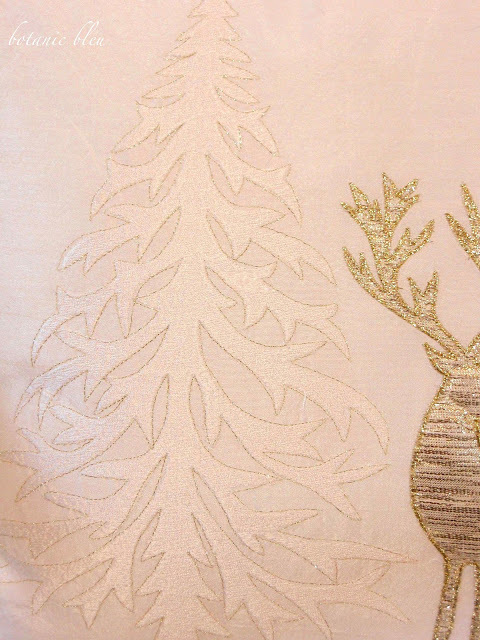 Thank you for sharing with us on how such subtle details make all the difference in decorating. My first love always is Boxwood! 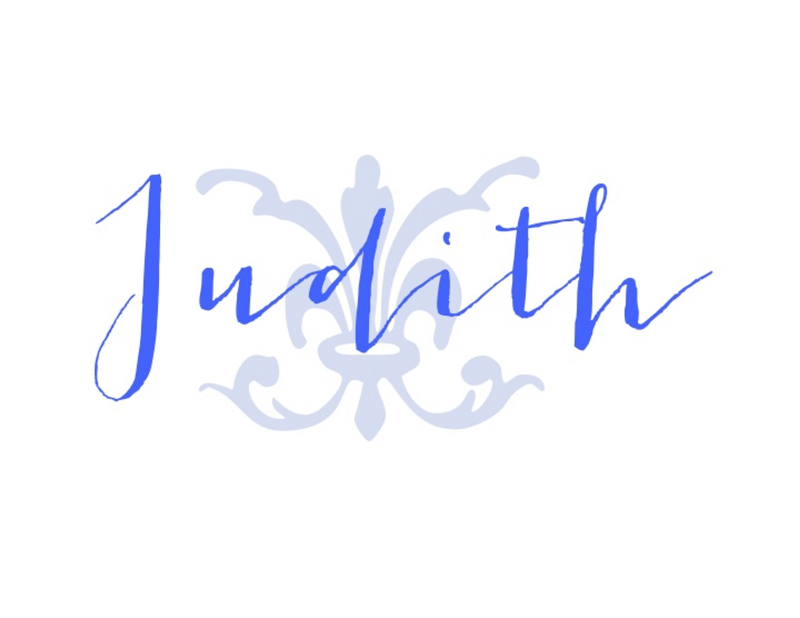 It's lovely, Judith! I also love how you share ways to achieve the details. Enjoy your Sunday. 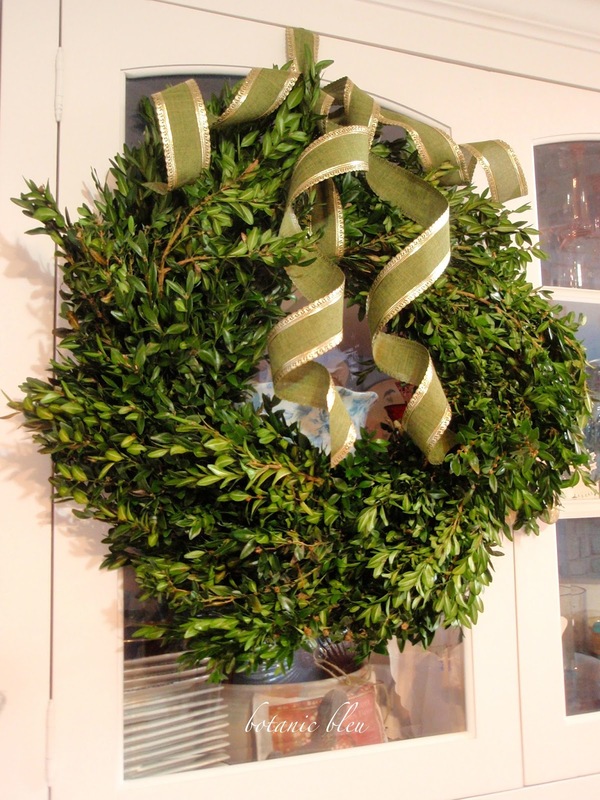 I really do need to get myself a boxwood wreath. SO right. Details do make the difference. 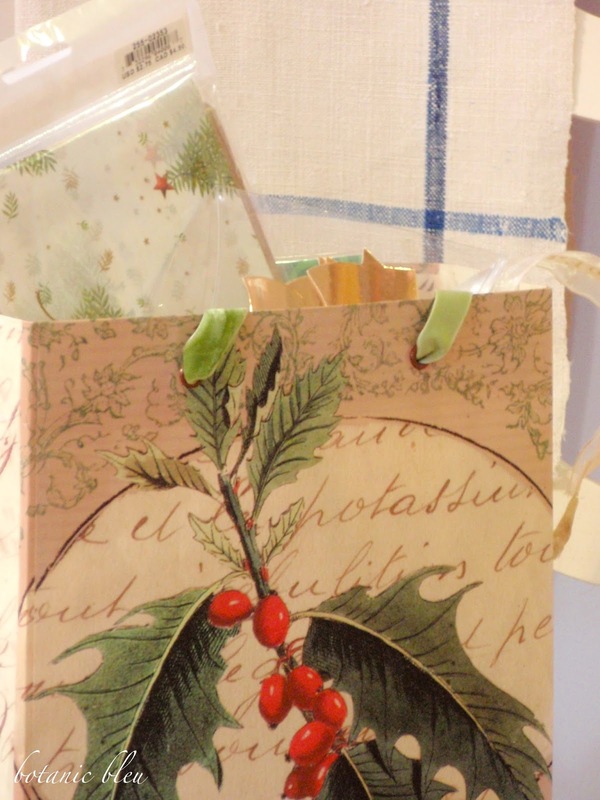 I tried to find boxwood this year, but it was so expensive I passed. Lovely! I can't wait for my boxwood to grow enough for me to make wreath out of it. Your touches a just lovely! Boxwood is always so elegantly simple. It looks lovely in your dining room. Judith it looks wonderful here, you never disappoint. 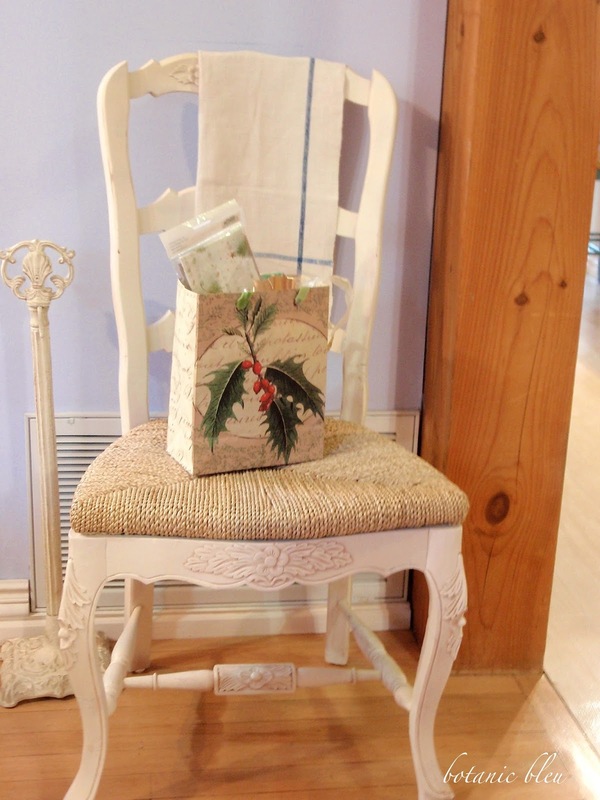 Loving your pillow silkend with Gold threading of a dear...the boxwood always does it for me, as for your French chair, there is something about that photo with its gifting set on a rush seat that has me in awwww! It really feels like Christmas old world. Judith, I just love the boxwood touches in your home. I'm currently looking for a boxwood wreath to go in the window in my kitchen, but can't find one I like...the search is on...LOL. 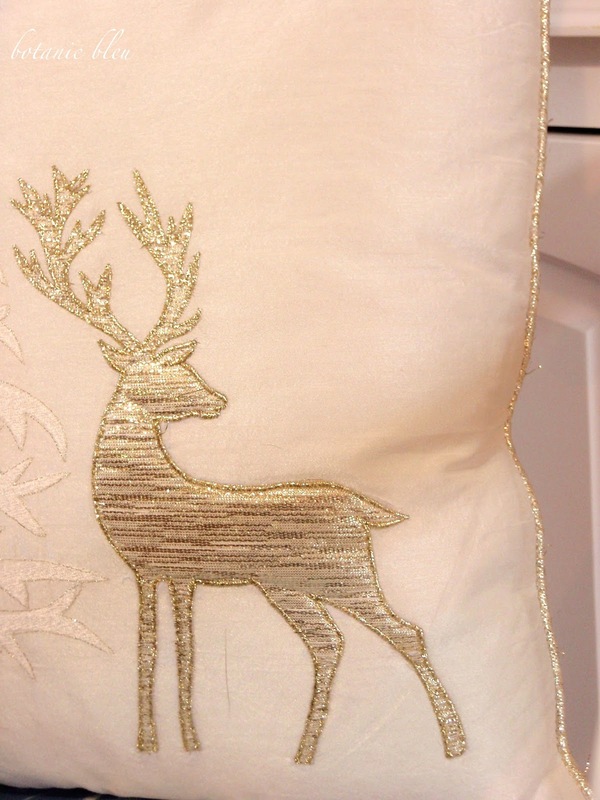 LOVE that pillow...so elegant! 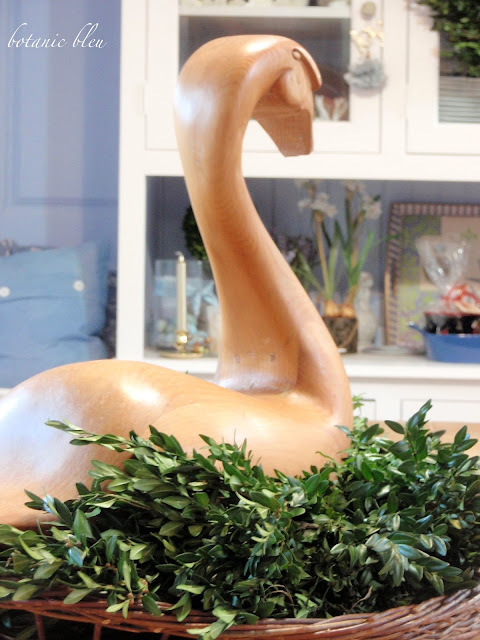 Good Morning Judith, you can't go wrong with boxwood wreaths and they look beautiful on your hutch on and surrounding your fantastic goose. 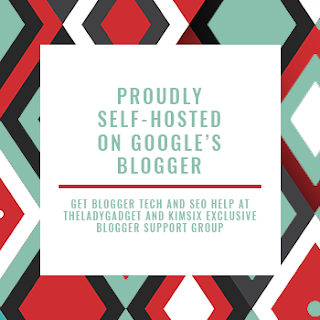 Thanks for the little tidbits at the end of your post. Plant Polish! Brilliant. And like you, I have not wrapped the first present! Must do that today as several need to be mailed. The touches of green are just perfect! I love how the ribbon curls on the wreath adorning the china cabinet!